Wouldn’t you love to have a recipe for a simple but delicious treat you can whip up to satisfy your chocolate tooth or to give as a cute, homemade gift? 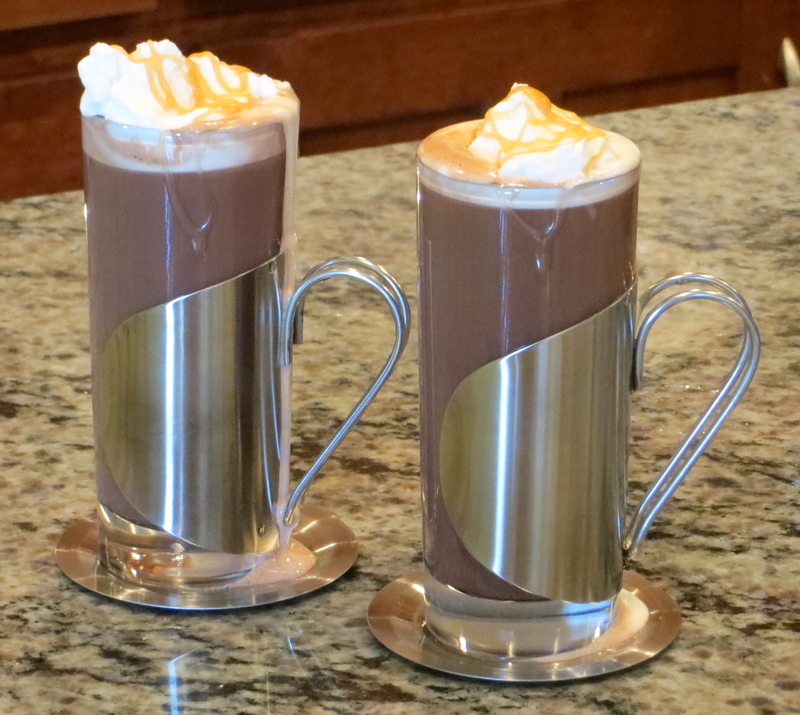 This hot cocoa recipe will serve both purposes. I have never been a big fan of store-bought hot cocoa mixes — they are just too weak. And that’s even after mixing it with milk instead of the prescribed water. Fortunately, I found this recipe that allows me to keep my own homemade cocoa mix on-hand for chocolate emergencies. 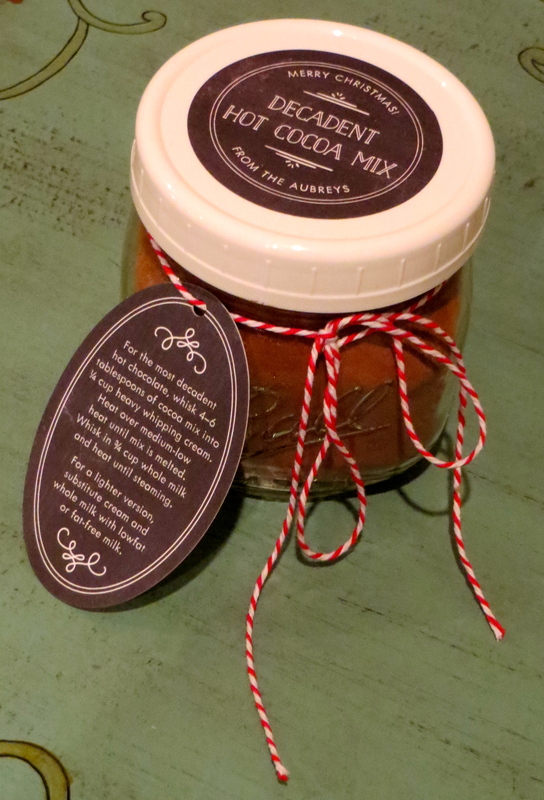 This recipe is also great made in bulk to fill cute mason jars and give as gifts — to teachers, neighbors, coworkers, etc. I made gift boxes of homemade goodies for my stepson’s teachers and included this cocoa mix, this Cheez-It Crack, Fantasy Fudge, these nuts from Ina Garten, Spiced Caramel Pear Jam (will try to blog soon), and homemade marshmallows (made by The Marshmallow Fairy). A few notes on ingredients — since the flavor of the cocoa really shines through, please use the best cocoa powder you can find. I have tried this recipe with both Callebaut Dutch-processed cocoa and Hershey’s natural cocoa, and there is a definite difference between the two. The mix made with the Hershey’s cocoa has a chalky feel on the tongue while the Dutch-processed cocoa was silky and smooth. I assume this is because Dutch-processed cocoa typically has a higher fat content than store-bought cocoa. For the bulk recipe I made to put in jars, I substituted the vanilla extract with pure vanilla bean powder that I bought at my local health food store, but I think regular vanilla bean seeds could be substituted 1:1. A few notes on serving — it is important to heat the mix with a small amount of cream or milk before you whisk in the rest of the milk. This extra step ensures your cocoa powder “blooms,” or develops its full chocolate flavor. You can substitute low-fat or fat-free milk for the cream, but don’t skip this step. You can also garnish the cocoa as desired. I stirred homemade salted caramel sauce into mine, topped it with homemade whipped cream, then drizzled a little more caramel sauce on top. And cute mugs don’t hurt. Yum! 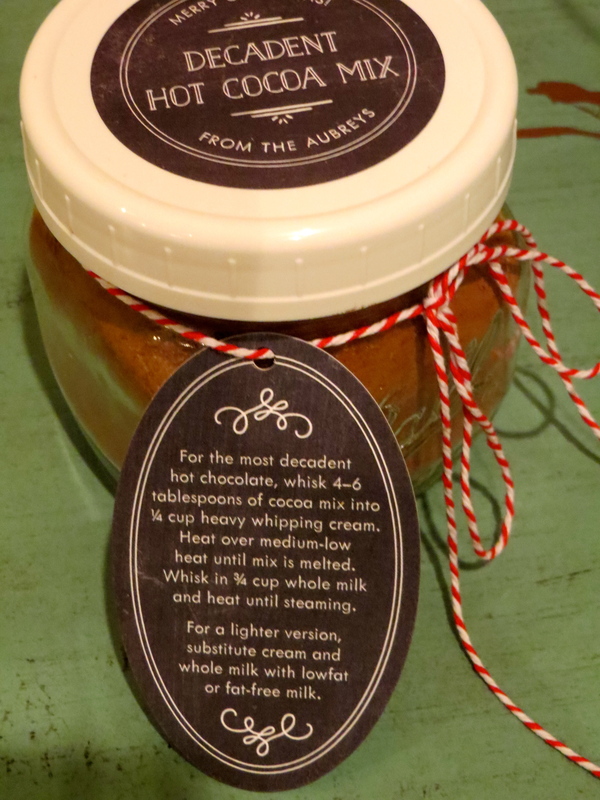 Below you will find a recipe to make both one single serving and a 1-pint jar of mix for gift-giving (or just pantry stocking). Enjoy and Merry Christmas! Combine all the dry ingredients with 1/4 cup cream or half-and-half and whisk over medium-low heat until the cocoa and sugar have dissolved and liquid has become dark and silky. Whisk in the remaining dairy and heat until steaming, whisking frequently. Pour into a mug, garnish as desired, and enjoy! Combine all ingredients in large bowl, whisking to blend well. Pour into one-pint container and store at room temperature. To serve, whisk 4-6 Tablespoons of mix with 1/4 cup dairy until melted and smooth. Whisk in 3/4 cup dairy and heat until steaming. Garnish as desired. Being an empty nest part of the week, we tend to eat out a lot. And even with just a party of two, that can get expensive, especially when you aren’t satisfied with the same few restaurants over and over again. Mr. Homemaker and I knew transitioning to exclusive at-home dining wasn’t going to be easy for us — sure, having a goal helps — but we knew that we would have to keep the menus fresh and interesting to keep us motivated. So each weekend we sit down with our bi-weekly produce delivery list and come up with a tentative menu and grocery list. I use the Epicurious and Food Network websites as well as some of my favorite food blogs for inspiration and recipes. 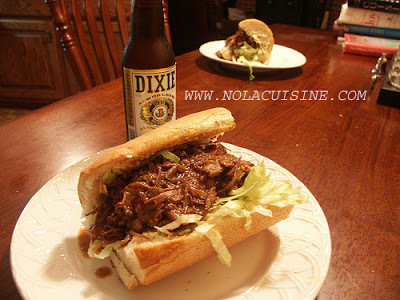 We also try to recreate some of our favorite restaurant dishes at home. So far I would say we have been pretty successful. In the past month, we have only eaten out once, and that was just a shared fajitas for one at the cheap Mexican joint. Compare that to our prior habit of dining out 6-7 meals (lunch and/or dinner) per week! We have also enjoyed spending time together in the kitchen getting back into one of our mutual hobbies. Each meal inspires us to cook up different menus and dishes for the next week. So since I don’t have time to do an individual post for each recipe that we have enjoyed, I am giving you a recipe round-up and brief review so you can enjoy these dishes, too. Please feel free to ask questions in the comments and I will do my best to answer them. And when we make these things again, I will try to takes pictures and add those to this post. 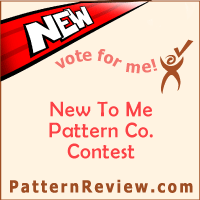 I am also giving each recipe my star rating along with my review and suggested modifications. Total possible stars = 4. None of the photos are my original photos — they are the property of the recipe source. Click recipe title for source. We LOVE these tacos. We have made them twice now in the span of two weeks. They are easy and quick to throw together. We make them exactly as directed (yes, we put in the olives AND raisins), but we do buy a more tender cut of meat since we found the skirt steak to be way too tough on the first round. We prefer sirloin for this recipe. It would even be great with left over filet 🙂 I also use mild Rotel as the regular makes the tacos a bit on the spicy side. 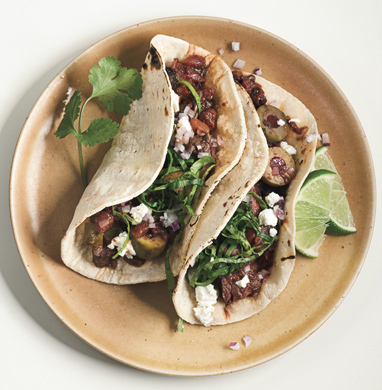 We top our tacos with a healthy dollop of sour cream to tame the heat. 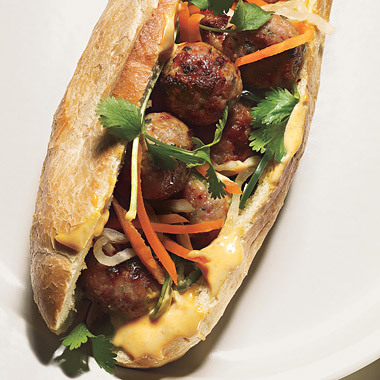 These meatball subs were one of our attempts to keep things interesting in the kitchen. This recipe is another one that is simple to throw together although some of the ingredients can be harder to find (my local Publix did have some Daikon radish). Matt really enjoyed the pickled carrot and radish topping and has eaten it as a side with other dishes since (the recipe makes more than enough). I am giving it three stars because some of the ingredients can be hard to find but I do love the flavor combination that it creates and I think the meatballs would be good served alone as an appetizer (or even in spaghetti). Did you notice this one got 5 stars? If you check out the recipe link, you will see that it was created by Thomas Keller, one of my favorite chefs. I have raved previously about one of his other roasted chicken recipes, and since y’all know I don’t discriminate against a roasted chicken (that’s two already on this blog), I had to try this one. Funny thing is, I didn’t realize this recipe was by Thomas Keller until the day after I made it. I have now deemed him Dr. Chicken. But to get to the point, for no more time and ingredients than this involves, you will never put a better piece of chicken in your mouth. Like shut up and go slap your momma good kind of chicken. And so easy you just season the chicken with salt and pepper and throw him in the oven in a skillet. Then when he comes out, slather him with a little butter and maybe a little thyme if you feel like it. And his skin will be so crispy and his meat will be so juicy. And not to mention flavorful! Please, before I ruin my keyboard drooling all over it, just go make this chicken — you can easily do this on even a tired weeknight! 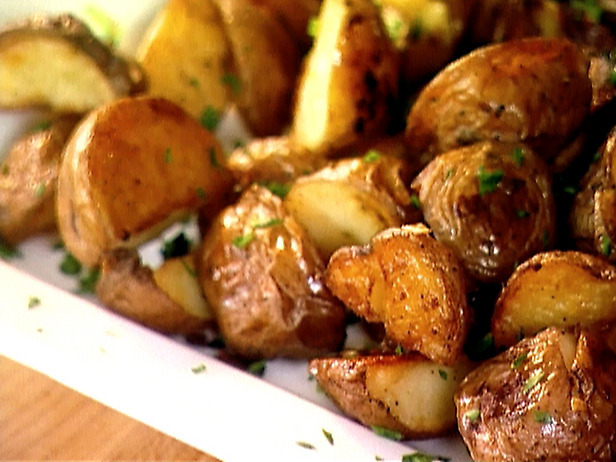 Who doesn’t love garlic roasted potatoes? Enough said. I referenced a meal in a prior post that my husband deemed one of the best I had ever cooked — this was it. 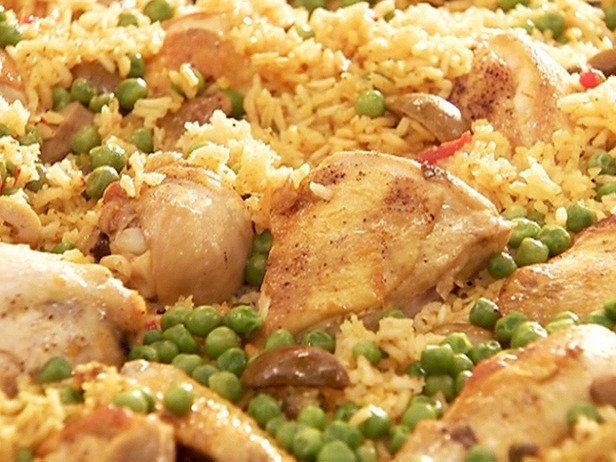 I woke up on my day off craving something exotic but comforting and for some reason Arroz con Pollo came to mind. Now, don’t think Arroz con Pollo is something we ever ate as kids — we didn’t even eat the American version of chicken with white rice. But I have seen it on menus and have seen recipes enough recently that it sounded just exotic enough and just comforting enough to fit the bill. And boy did it! The smell in the house was incredible and the process to create it was fun and new — I definitely learned some new techniques while preparing this meal. And sofrito, the seasoning blend used to flavor the rice, has become a staple for us to make various things such as Spanish rice and stuffed peppers. If you have some kitchen skills, I definitely recommend trying this recipe out — it is well-written and if followed, will yield wonderful, flavorful results. I had a pint of fresh raspberries in the fridge that had gotten a little too soft to eat straight so I went in search of a cocktail recipe. This one from Bobby Flay was on the top of my to try list and it didn’t disappoint. The basil is not very strong but does add just a hint of herbal flavor that I found very refreshing. I will definitely be making this one again and maybe it will be a Thirsty Thursday if I can get a photo of it. Who doesn’t love lasagna? And lasagna that you don’t have to layer and mess up every dish in the kitchen for? That’s even better! This lasagna is easy to throw together and tastes great. I substituted ground beef for the Italian sausage just for personal preference. I found it to run a little dry so I ended up adding the whole second can of tomatoes and then a little more water as it cooked. I also reduced the cooking heat a little as it seriously stuck to the bottom of the skillet. Although the one skillet was a cleanup nightmare, the soul-warming meal was worth it and I will definitely make it again. 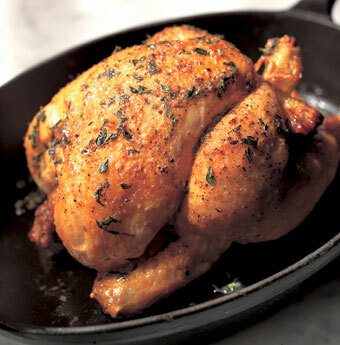 This is another Thomas Keller recipe that I found while browsing the Epicurious site. I think this recipe is a great base for creating other flavors but I haven’t really had time to experiment yet. So far we have just put it on basic green salads seasoned with some salt and freshly ground black pepper. I had a serious craving for chocolate chip cookies last night but didn’t want to be in the kitchen all night changing out batches in the oven and didn’t want the temptation of eating 3 dozen so this little recipe for 12 cookies was perfect. I added a few toasted pecan pieces and they were divine warm out of the oven! I saw this recipe come up in my blog reader and I was sold on the brownie with frosting. As a kid my mom always made wonderful brownies but they never had frosting and I always craved brownies with frosting. I guess I now have an unfulfilled desire for frosted brownies because I make/eat them when I can. 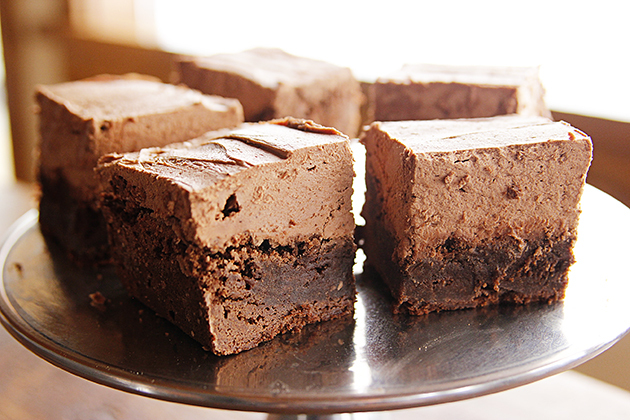 These brownies were decadent and tasty and the girls in my office RAVED about them. I found the brownie base to be a little bland to stand alone but with the frosting it is just fine (if you are going to make it without frosting, I would add a little salt or vanilla). My issue was with the frosting. The recipe calls for too much water. At the ratio given, the butter separates out and curdles. I think the recipe should call for 1/2 to 3/4 of the amount of water listed and next time I will stop at that. Because I wanted to follow the recipe as written (I am a rule follower), I added all the water and I regretted it. I ended up adding more sugar, butter, and cocoa trying to get the butter to re-emulsify. I got it to be palatable (based on compliments), but I wasn’t please with the grainy appearance of the frosting. I will definitely remember this next time I make this recipe. I made this for the Fathers’ Day dinner at my parents’ house. All but 2 slices were eaten that night and everyone said it was the best cheesecake that had ever had — better than New York City’s itself. I think that’s enough explanation! Since I was worried the kids wouldn’t want to eat cheesecake, I also took cupcakes to our Fathers’ Day dinner. I have made this recipe before and it is a moist and tender cake with a good vanilla flavor. My only gripe with it in cupcake format is that it doesn’t crown well and it pulls away from the cupcake wrappers. 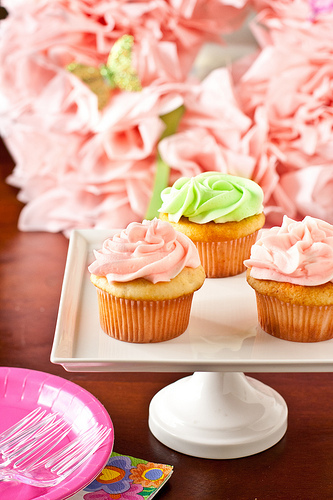 My suggestion is to fill the cupcake papers closer to 3/4 full and this will help keep them from pulling away. If you are looking for a good basic vanilla cake, though, this is it. I omitted the vanilla bean and doubled the extract. I hope you have enjoyed my little recipe round-up here. Let me know if you try any of these recipes or if you have any suggestions for tasty new recipes to try out! Howdy Friends! I hope everyone has been well and had a wonderful Thanksgiving holiday (if that is the tradition in your country). 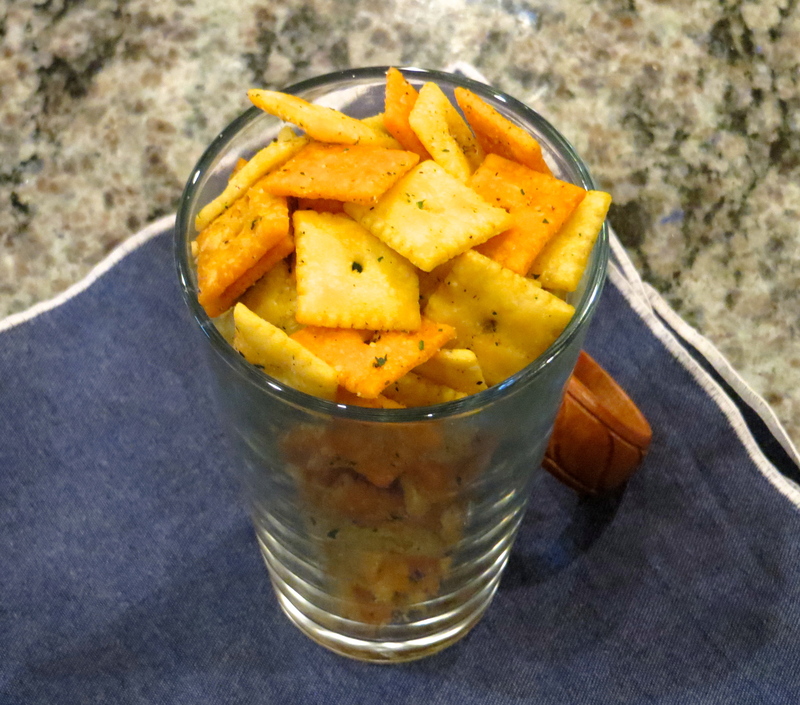 I am sharing a quick recipe with you today that will revolutionize your snacking habits — it will cause you to have the most intense cravings and desires at strange hours of the day — hence the name Cheez-It Crack. 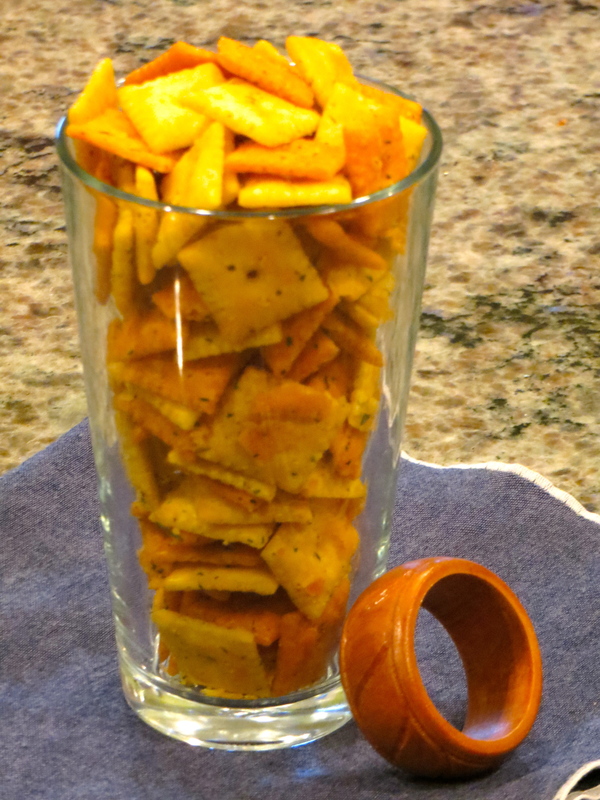 You might think Cheez-It crackers are kind of plain. You got over those when you were a kid. Well, with the addition of a select few spices and some olive oil and a brief stint in a low oven, your lowly childhood crackers will be turned into your adulthood snacking drug of choice. This salty-tooth satisfier takes about 3 minutes to put together and another 20 to bake. Your friends will beg you to make them more and you won’t deny them because you know you need more yourself. So go ahead and whip up a batch for yourself this weekend and find out what all the fuss is about! Preheat oven to 250F. Combine all ingredients in a large bowl and toss well to coat. Spread crackers on a large cookie sheet and bake in the preheated oven for 20 minutes, stirring halfway through. 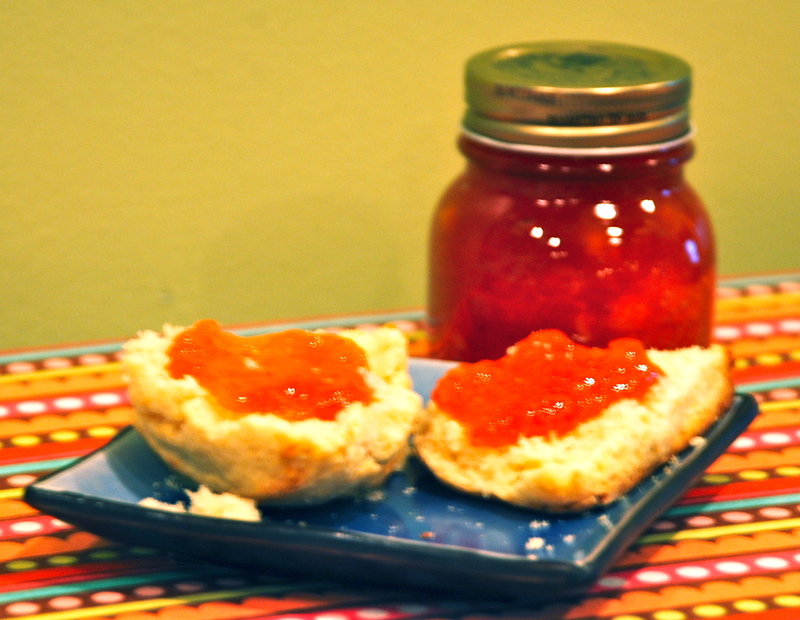 As promised, today’s post is all about making your very own, homemade, totally-from-scratch, delicious, fresh peach jam! Before I give you the recipe details, I want to talk about a few important points regarding canning foods at home. 1. Canning food at home is EASY! You don’t have to have a bunch of special equipment or skills. Our foremothers did it with fewer modern conveniences than we have today (think hot stove and no air conditioning 😉 ). 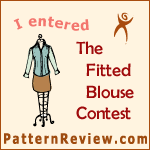 Don’t be intimidated –you can do it and you will be so glad you did! 3. Canning food at home is FUN! Grab a bunch of friends and make a party out of it. Choose two or three recipes and spend the afternoon putting up several different preserves so that everyone’s pantry is stocked with a variety. 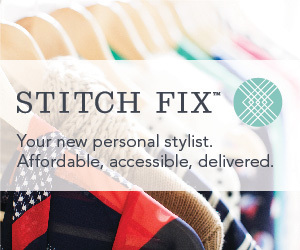 Or better yet, knock out part of your Christmas list early. As an added bonus, there will be extra hands around to help clean up the kitchen when you’re done. If this is your first time canning, you may want to click over to the National Center for Home Food Preservation site to familiarize yourself with the basic principles of home canning. 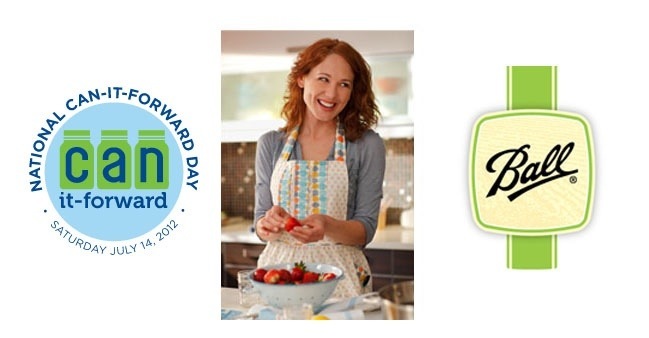 You will find answers to all of the why’s and how’s of canning as well as recipes for sweet and savory treats to put up. 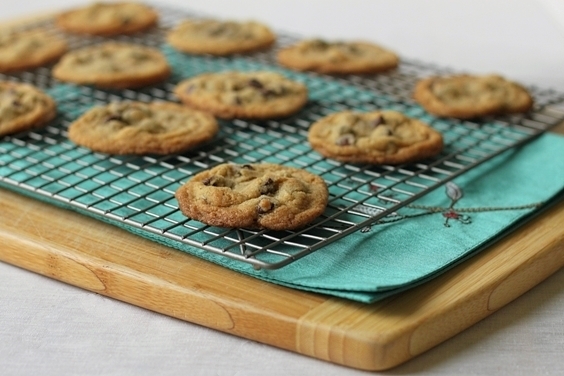 Preheat the oven to 200 degrees F. Arrange 7 clean, dry half-pint jars on a kitchen towel on a large cookie sheet. Place the jars in the oven to keep warm until needed. 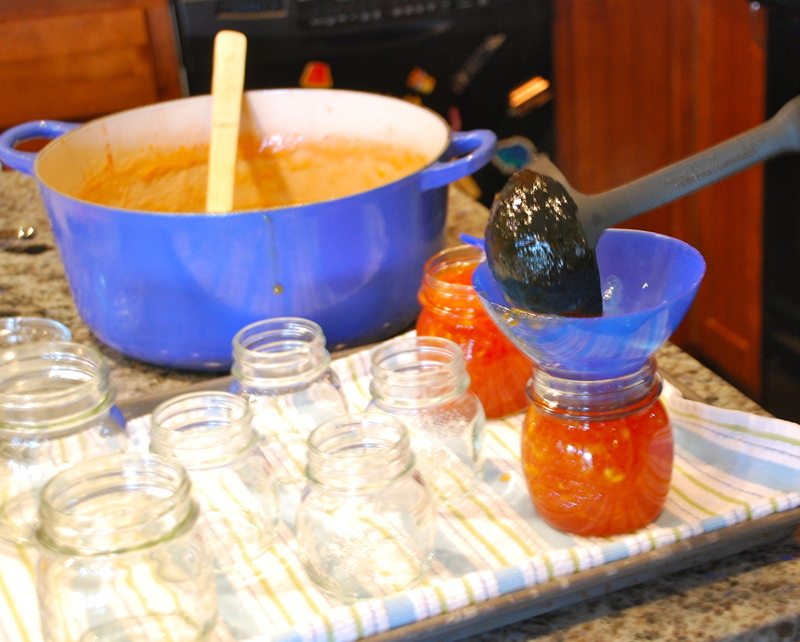 This will help sterilize the glass and make the temperature of the jars closer to that of the jam when you pour it in. Place the (clean, brand new, never been used before) lids in a small bowl or pot. Cover with very hot water. Bring a large stockpot of water to a rolling boil. Meanwhile fill a large bowl with ice water. Using a small paring knife, cut a small, shallow X into the skin on the bottom of each peach. Place 3 peaches in the boiling water for 90 seconds. Remove them immediately and submerge them in the ice water. 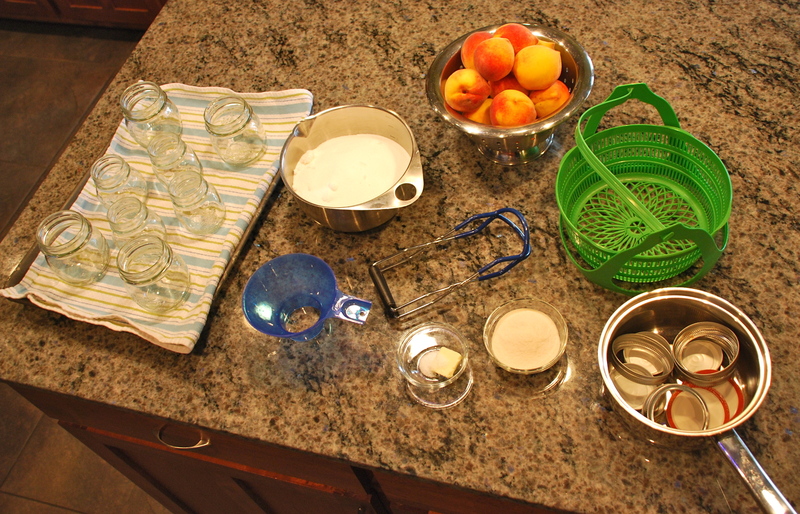 This process will loosen the skins and make the peaches a cinch to peel. Repeat the process until all the peaches have been blanched. Once the peaches are cool, peel the skins off with your fingers. Cut off any bad spots with a small paring knife then pit and quarter the peaches. Place the peach quarters into a medium bowl and mash with a potato masher. Rinse out the large pot and refill with fresh water and return it to high heat to boil. This will be your boiling water bath. Measure exactly 4 cups of mashed fruit into another large pot and add in lemon juice, pectin, butter or margarine, and salt. Place the pot over high heat and bring the fruit mixture to a rolling boil (a rolling boil is one that doesn’t dissipate when stirring). Once the fruit mixture is at a rolling boil, stir in the sugar and return to a rolling boil, stirring constantly. Continue to boil, stirring constantly, for exactly 1 minute. Remove from heat and skim off any foam that has formed (although there shouldn’t be any since you added the little bit of butter). Carefully ladle the hot mixture into the clean jars using the funnel (if you have one), filling the jars to within 1/2″ to 1/4″ of the top of the jar. Wipe the rims and threads of the jars with a clean damp cloth. Carefully remove the lids from the hot water, trying not to touch the seals, and position them on the jars. Screw the rings onto the jars until they are “fingertip tight,” i.e. just until you meet resistance and then a quarter turn more. The goal is just to get it tight enough to hold the lid down. You don’t want it so tight that it drags the seal along the jar. By now your large stockpot should be boiling. Carefully place some of your filled jars into the canning rack and gently lower it into the boiling water. 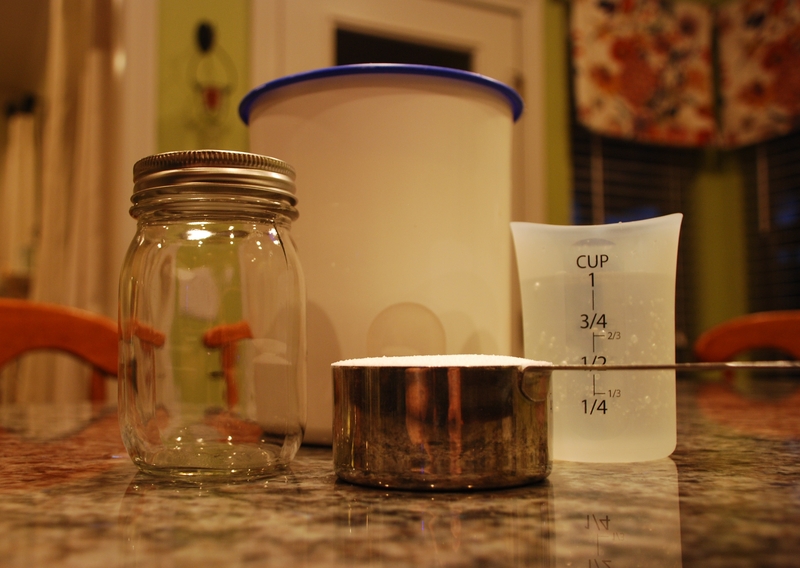 Make sure the jars are covered by at least 1″ of water. If they aren’t, add a little more water. Put the lid on the pot, and bring it back to a rolling boil. Once it starts boiling, start the timer for 10 minutes. After 10 minutes, carefully remove the jars with the jar lifter and set them on a clean, dry towel and leave them undisturbed for at least 12 hours. Sorry for the recent radio silence in these parts. I don’t have a lot of excuses other than a short weekend getaway to New Orleans for some shopping, a bout of tonsillitis (thanks again, Mom, for the TLC), and a holiday. I hope you have been enjoying your summer! Here’s another refreshing summertime thirst quencher for you. 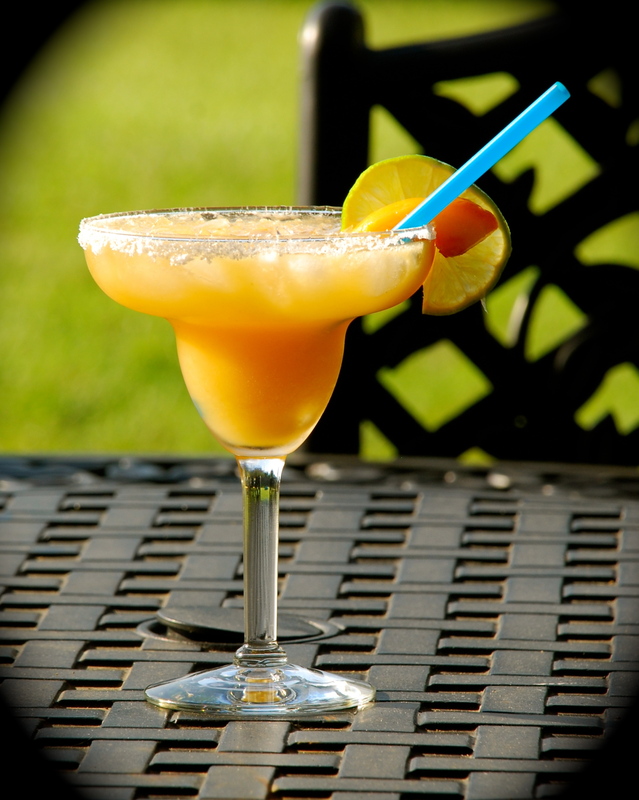 It’s a delicious margarita with a hint of peachy flavor. It’s definitely not overly fruity. You can blend this up if you want, but I think it’s better on the rocks. To make Peach Simple Syrup, combine 1 cup Simple Syrup and 3 peeled, pitted, and chopped peaches in a blender or food processor. Pulse to combine until smooth. Adapted from how sweet it is. I hope you will find these tips useful and if you have any good tips of your own, feel free to leave them in the comments section. P.S. 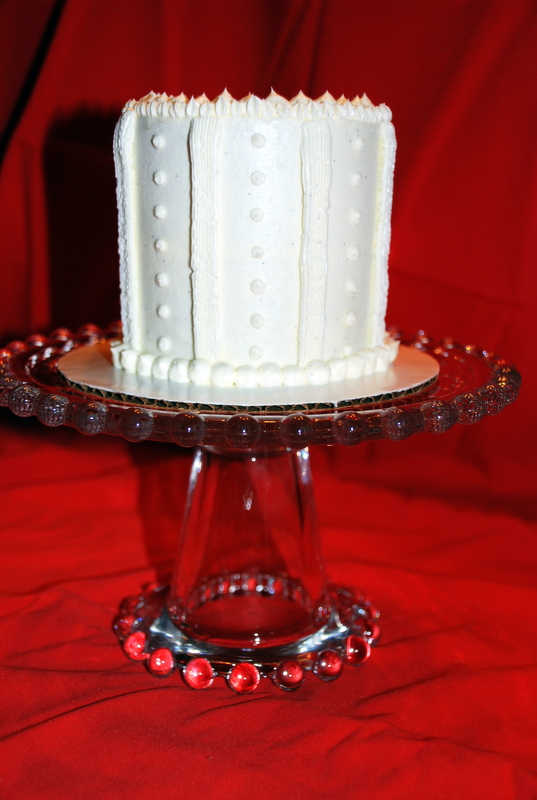 The cake photographed above was made a while back for my aunt’s mother-in-law’s 90th birthday. I had the cake layers and frosting made up and then got food poisoning. My wonderful mother came over at the last minute to finish assembling and decorating the cake and delivered it to the party. Thanks again, Mom! Most butter or oil based cake recipes will instruct you to grease and flour your pans. I don’t know about you, but I always get flour everywhere when I do this. 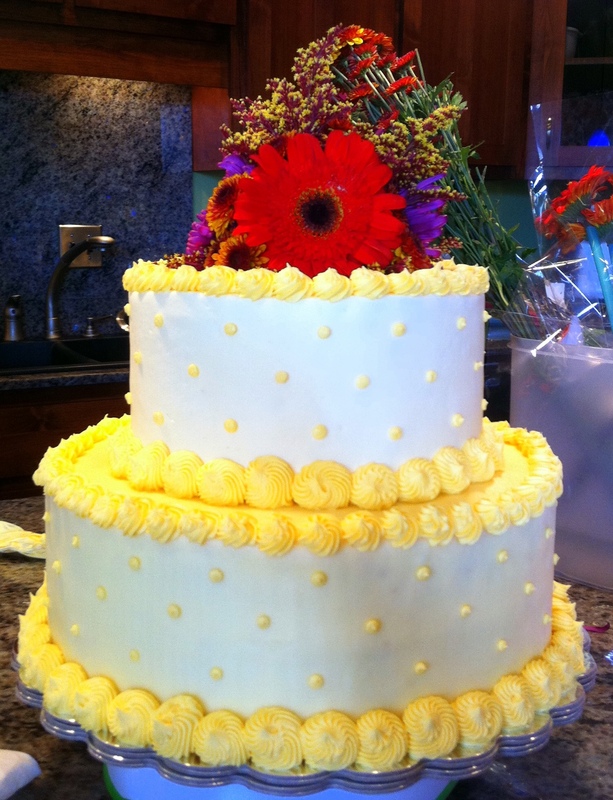 When I took a cake decorating class at a local community college a few summers ago, the instructor presented this brilliant technique. Combine both ingredients in a small bowl and beat with a hand mixer until thoroughly combined. Scrape into an airtight, resealable container and store in the pantry. Using a paper towel or pastry brush, spread a generous amount in cake pans to prepare for baking. No need to shake flour in and then tap it out. This also prevents that cake-y, flour-y mess on the outside of chocolate cakes. This paste will keep stored in the pantry indefinitely (at least for as long as your shortening and flour would have been good for). In recipes that call for buttering, lining with parchment, then buttering and flouring the pans, I have found that just a good coating of this stuff is sufficient. 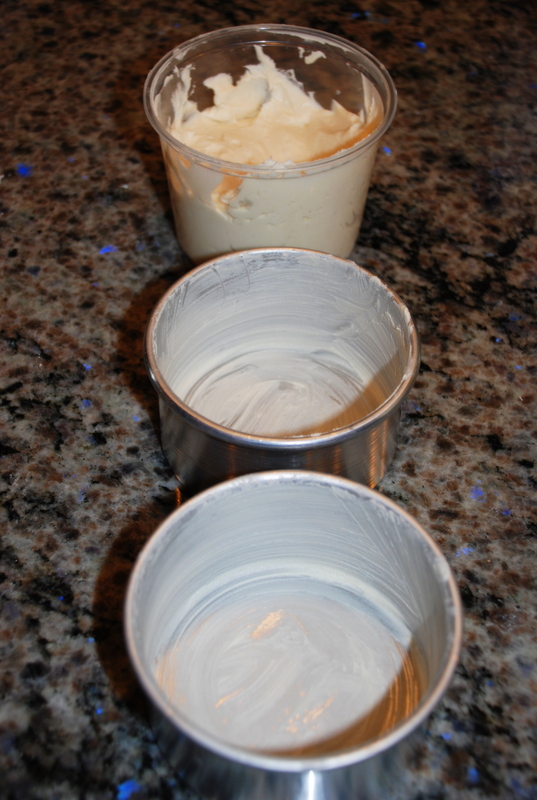 But note that this paste should not be used for cakes that do not call for greased pans. I do several things to make sure my cake layers are level. First, I use insulating strips around my cake pans. Wilton makes these and you can buy them at Hobby Lobby or Michael’s. You can also use wet strips of dish towels wrapped in aluminum foil. 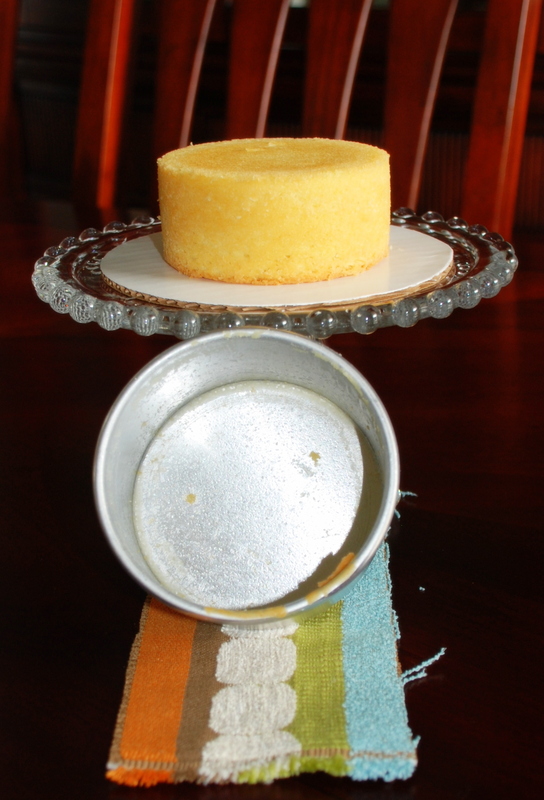 The theory is that by insulating the edges of the cake pan, the edges of the cake do not cook as fast, therefore, they will rise higher and be level with the center of the cake. Rotate your pans partway through baking to make sure your layers bake and brown evenly. Another tip I learned from my cake decorating instructor — press down gently on the top of your cake layers with a clean kitchen towel or paper towel immediately after removing them from the oven to level any high spots. After cooling my cake layers in the pans for 10-20 minutes, I turn them out (top-side down) onto parchment-lined cardboard cake boards and leave them there for about 10 minutes. 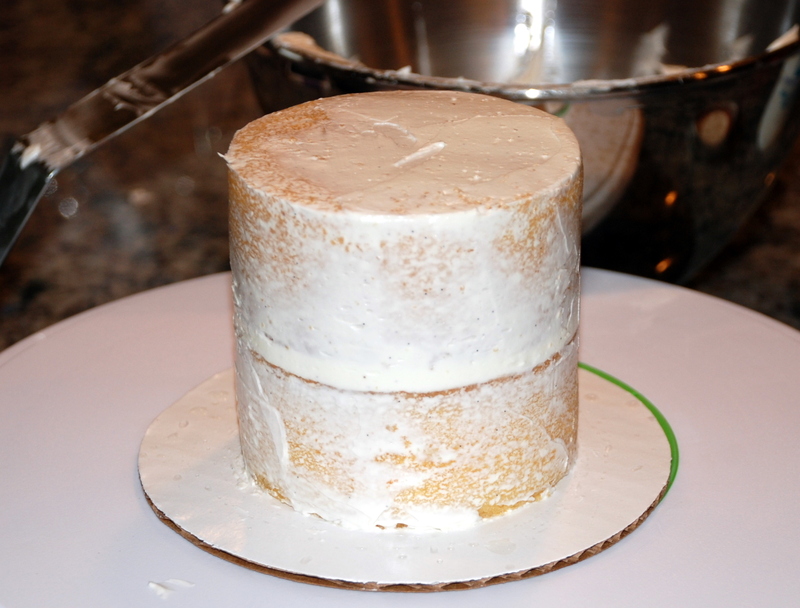 I then slide the cake and parchment off of the cake board onto the cooling rack to finish cooling completely. This is a trick I discovered myself that makes the top super smooth and flat and the edges very square. Using these tricks, I haven’t had to level a cake layer with a knife in a very long time. If you have gone to all the trouble of making your cake beautiful and level, you don’t want stray crumbs in your frosting. Once you have filled and stacked your layers, apply a thin coat of frosting on the sides and top of your cake then place it in the fridge or freezer for 15 minutes or so to allow the frosting to set up. This will seal in crumbs and make it less likely for them to escape into your outer coat of frosting. This is especially important if you are frosting a darker cake (like chocolate or red velvet) with lighter frosting (like cream cheese). So I decided to keep my first post “simple.” I am always amazed to see bottles of simple syrup on the shelf at the grocery store on sale for exorbitant amounts ($5-6 for the one pictured below). 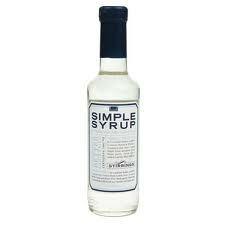 Simple syrup is just a supersaturated water and sugar solution. You combine equal parts of granulated sugar and water together in a heatproof container and heat it until all the sugar is dissolved. You can do this in the microwave or on the stove. You could even do it over an open flame if the need arose. Then let the solution cool and use as desired. Store it in the fridge where it will keep for at least two weeks but I’ve used it a month later and it still tastes fine — it is just sugar and water after all. You can create custom flavored simple syrups for different purposes. I like to make a lime zest-infused one for my homemade margaritas but you could also infuse with basil, lavender, etc. Alternately, I mix it with a little rum to brush on my cakes before frosting them to keep them extra moist and flavorful. You could also infuse it with some vanilla beans for cakes or drinks. Simple syrup is also great for sweetening iced tea since the sugar is already dissolved. The sky is the limit where this is concerned.